next post: What is Wall Street for? George Osborne, Britain’s vandalising exchequer gave his Conservative Party Conference speech yesterday in Manchester. The Transcript is courtesy of the New Statesman. Like everyone I scanned the speech for signs that the British Government was prepared to suspend its ideological arrogance for the sake of the economy, which the people had entrusted them to revive. No such luck. Instead the nation was presented with a self-satisfied denial of the basic problem that is sending the British economy into reverse gear after showing some signs of recovery about the time the national government changed hands. The problem for Britain is that the Government has outlined the wrong problem and proposed the wrong solution. But borrowing too much is the cause of Britain’s problems, not the solution. If he had been referring to the private domestic credit binge then I might have agreed. But, in fact, he was constructing the crisis in terms public borrowing that accompanied the fiscal stimulus – which on any reading of the data underpinned the nascent growth that has now petered out. He claimed that a “British economy freed from its debts; growing strongly; spreading prosperity to all our people” was the “prize” that had all British people had to keep their eyes while being “careful not to talk ourselves into something worse”. Last night on Australian TV, the Australian Broadcasting Commission’s Four Corners program ran a documentary they called – Poor Kids. It is a very sad tale. It is about deepening child poverty in Britain. The incredible fact is that in the advanced world the younger generations are facing higher poverty rates than their parents generation at a time when average per capita income is generally rising (after taking a hit during the worst stages of the crisis). The reason is that inequality is rising and persistently high unemployment is concentrated among disadvantaged groups. The bankers and their cohort are once again doing very well – helped along by government bailouts – but the unemployment living in inadequate state housing face very bleak futures. It is hard to see George Osborne’s message providing any hope to the kids and the parents in the story. Eurostat report that youth unemployment in the UK has risen from 15 per cent in 2008 to 19.6 per cent in 2010 and now stands at 20.4 per cent. But the Four Corners program also shows how unemployment among the adults dramatically reduces the opportunity set available to their kids. so we can fulfill that solemn promise to the next generation … we will leave the world a better place than we found it. There is no doubt the current policy set will leave Britain in a worse place than it was in 2010. It is already sliding downhill from where it was in May 2010 and it will get worse. Osborne then conducted some causal analysis and concluded the the crisis was “created by the mistakes of human beings” which is not a very remarkable finding. The only problem is that his list of “mistakes” is the wrong list. First, the last government borrowed too much money. They thought you could borrow without regard to ability to pay, spend without regard for value for money, all on the premise that boom would never end in bust. They saddled the country with the worst debt crisis in our history. There is no public debt crisis in the UK. It is a total fabrication of the conservatives to, first of all, win office, and then, to renew their traditional attack on the Welfare State and trade unions and ensure that a higher proportion of real income is transferred to the privileged. Since 1971 (or thereabouts), the British government has never had an issue with meeting all its sterling obligations. It may have spent unwisely but that is a separate issue from whether it was always solvent. I also wondered about the historical veracity of the claim that this was the “worst debt crisis in our history” – just in terms of the history of public debt ratios in Britain. My conclusion is that Osborne lied to the assembled audience in Manchester. 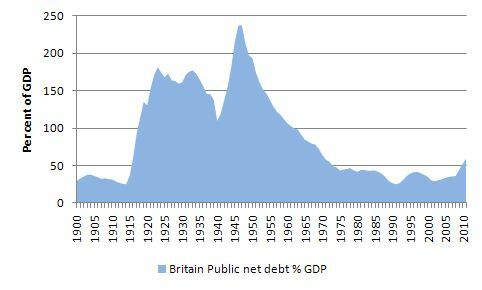 The following graph cobbled together from data I have accumulated largely from the British Treasury sources shows net public debt as a percent of GDP in Britain from 1900. The longer time series tends to put “currency” into perspective. Further remember that for much of this period the British government was operating with a convertible currency system which places more financial constraints on it that at present (with a fiat monetary system and a floating exchange rate). The ratio peaked in 1947 at 237.94 per cent reflecting the war effort and the residual of the Great Depression. If you then ask what followed in the recovery period after the Second World War you will realise that the British government introduced a comprehensive Welfare State including the Nationalised Health Care system and the economy grew strongly until the mid-1970s, all the while reducing the public debt ratio. Coupled with information from the UK Guardian’s Datablog (Spreadsheet Download) we can see the history of the public net debt ratio (as a per cent of GDP) since 1946 in Britain. The last two years are the Conservative-Liberal Democrat coalition which for all intents and purposes is Conservative. 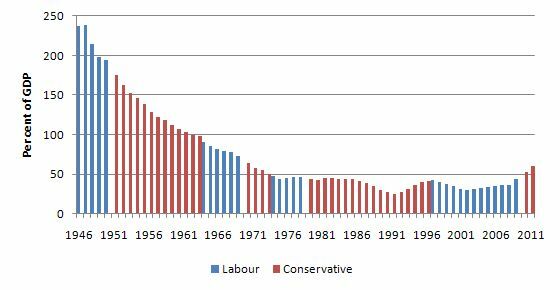 The evidence doesn’t support the conjecture that the Labour Party ran up more debt than the Conservatives. … who ran up staggering debts of their own, buying financial instruments even they couldn’t understand. The banks and those regulating them believed that the bubble would never stop growing, that markets were always self-correcting, that greed was always good, that their ponzi schemes would never collapse, and that none of the debts would ever turn bad. I agree that the banks were instrumental in loading too much debt onto a poor risk base and because they were involved in a “pass the parcel” game (pushing securitised but unfathomable “assets” onto third-parties they didn’t really care. Finally, he blamed the Eurozone for designing a flawed monetary system. I agree completely with the fact that “Our European neighbours plunged headlong into the euro without thinking through the consequences” but the flawed design did not cause the crisis nor is it prolonging it. The poor design is a problem but even with that the ECB has the capacity to ensure there is enough spending in the EMU to stimulate growth. The reluctance of the Euro leaders to unleash that capacity and instead to impose harsh austerity onto the suffering economies is the reason the Eurozone is going backwards. Eventually a new government has to stop blaming the past regime and take responsibility for the state of the economy. The Conservative Government was elected in May 2010 at a time when growth was resuming and unemployment was falling. For a time, the fiscal stimulus of the previous government maintained growth even though the Tories were promising austerity. As the fiscal austerity starts to bite now and the economy goes backward and unemployment rises again there is only one entity to blame – the current British Government. The events in the EMU are not to blame. The past Labour government is not to blame. It is all down to the fiscal austerity that has been imposed on the domestic economy. We then moved on to hear what he was going to do about the obstacles “to jobs and prosperity”. He rejected public borrowing claiming it would jeopardise “the priceless fiscal credibility that this government has earned with the international markets” and drive up interest rates. Clearly he lacks a feel for the empirical world. Why has Japan enjoyed zero interest rates for 2 decades despite having deficits and public debt ratios that make Britain look positively dwarf-like? Why are yields low and falling in the US? Obviously, he doesn’t want to acknowledge an understanding (if he has it) of how interest rates are set and the monetary operations associated with budget deficits (which place downward pressure on the central bank interest rate target). Please read the trilogy – Deficit spending 101 – Part 1 – Deficit spending 101 – Part 2 – Deficit spending 101 – Part 3 – for first principles in this regard. He had the hide to claim that fiscal austerity (“the deficit plan”) had “brought us the stability other nations today crave”. I don’t define stability in terms of a real economy that is heading back into recession and a labour market that is shedding jobs. That is an unstable situation. I also don’t see any “monetary” instability in other fiat currency-issuing nations (for example, the US or Japan). In outlining how the British government will “help business create new jobs” he said “low interest rates” was crucial. Maybe, but the Bank of England sets the interest rate rather than the Treasury. He gave a curious example of high rates of interest in the Eurozone but then said “Our budget deficit is bigger than the lot of them – but here in Britain our market interest rates are today just 2.5%” which would suggest that budget deficits have very little to do with interest rate determination in a fiat currency system. The comparison with Greece, Portugal, Spain or any other EMU nation with Britain completely misses the point that the EMU nations are not operating within a fiat monetary system. Credit means investment. Investment means jobs. I always find it curious that public debt is bad but private debt is good especially given that the financial crisis is really about excessive private debt fuelled by an out of control banking sector. The reason the private sector is not spending at present is because they have too much debt overall. So why would Osborne think the solution lies in expanding private debt? Why is it sound to replace public spending with private debt if private debt is excessive in the first place? He then outlined a scheme that he is trying to say is “similar to the National Loan Guarantee Scheme” (which they advocated in Opposition) but looks more like a borrowing scheme. The details remain somewhat obscure. He said that the Government has “set the Treasury to work on ways to inject money directly into parts of the economy that need it such as small businesses” which he called “credit easing”. As best one can work out “credit easing” might see HM Treasury purchasing billions of pounds worth of bonds issued by SMEs to provide working capital to these firms to overcome their lack of access to bank loans. An aide later said the Treasury would sell gilts and use the proceeds to buy corporate bonds issued by such businesses. The WSJ also noted that “small companies generally don’t issue bonds”. The UK Guardian article (October 4, 2011) – Credit easing – what is it? – was more helpful. Credit easing could involve banks packaging up small- and medium-sized firm’s debts and selling them on as securities to the Bank of England. George Osborne and the Treasury are still trying to work out exactly what their version of “credit easing” looks like but it is likely to involve buying corporate bonds – IOUs issued mainly by big companies – rather than bonds issued by the government (which is what the Bank of England’s “quantitative easing” is). Which addresses the fact that small businesses do not issue corporate debt instruments. So the plan seems to involve the banks packaging up “small company loans and overdrafts into so-called securitisations which could then be bought” in the corporate bond market. The Guardian says that the UK Government “is trying to avoid the Treasury making direct loans” to ensure the operation is deficit neutral. Instead it seems that they want to induce the banks to make more loans by pushing the risk on the Treasury. So it is a guarantee type scheme and if the loans work out they deficit would not be impacted. According to the latest Small Business Support – May & June 2011 – published by BBA, which is the “leading trade association for the UK banking and financial services sector” the reason that small business is not borrowing that they are actually trying to reduce their debt levels. The average monthly value of new term lending in the first half of this year, of £500mn a month, is only slightly lower than throughout 2010, but net lending has contracted more (£332mn a month) than last year. This reflects the appetite of small businesses to pay down their borrowings and, in an uncertain environment, with trading confidence fragile, build up cash reserves. The average monthly rise in deposits (£473mn a month) is significantly higher than in any year since the financial crisis, generating a record level of £58bn. The Report also says that “(t)he aggregate value of deposits in small business current and deposit accounts is strong”. In a related publication – Lending to UK businesses and individuals which allows one to compare the lending to SMEs and small business against business in general. The following graph shows the rate of grwoth in the stock of lending (not seasonally adjusted) to all non-financial corporations (PNFCs), small business and SMEs from March 2008 to May 2011. There were some missing observations for small business. The data shows that during the reduction in the growth of lending to small business and SMEs is not out of line with all firms. The problem facing the UK economy is a lack of demand. Cutting public demand at a time when private demand is weak and being driven by a lack of confidence will not solve that problem. There is too much private debt and the only responsible path for the national government is support the process of private debt reduction while stimulating growth via expanded budget deficits. The British Government clearly eschews that responsibility. What was even more astonishing was that Andrew Neil, no foe of the Tories had made a young woman on Osborne’s Treasury team look like an idiot – she has previously appeared mind-numbingly incompetent – over his proposal on credit easing. Neil was doing a Paxman and via persistence made it crystal clear that she had no idea what she was talking about even though apparently she and Alexander, no great light himself, had been working on this for months. Paxman of course later on in the evening made the concept’s opacity a weapon in a critique of Osborne’s speech. What is remarkable is that O’s presentation was much more assured than Balls’ was the previous week. Was the choice in the graph above to paint Labour blue and the Tories Red deliberate or Freudian? I reckon the Tories should adopt Mauve as their colour and Labour Puce. That would better demonstrate the largely symbolic difference between them these days. This is not the problem. The problem is that there is insufficient productive capacity to sustain the level of consumption that both the State and private sectors have become accustomed to in the last decade. The vast majority of the ‘economic growth’ of the years 2002-2007 was based on debt growth, mainly private. That growth is illusionary. It didn’t really exist. It was just dragging consumption from the future. You cannot just try and replace that ‘lost’ demand by the State (which after all is just the aggregate of the private sector) by the State taking on more and more debts itself. The true productive capacity of the UK economy (and therefore its true level of demand) is c. 10-20% lower than the GDP figures show today. Its no good thinking the State can ‘kickstart’ the economy by continuing to spend willy-nilly. Low growth is the new normal for the foreseeable future, and throwing money at the problem just increases the depth of the hole we are in. I’m confused. I demand to know what demand is. Jim has slipped into the same empirical black hole as poor old George. I’ve learned t’s no use discussing anything with these people. They will find any theory to suit their desired outcome, no unwelcome facts are too onerous to ignore. Great post again today Bill. The true causes of the shitstorm and the correct solutions are being outlined in ever greater clarity. The story is getting stronger and less resistable day by day. I dont underestimate the ability of fools to deny rational argument and empirical facts. It’s all good, because I do have faith the truth will win at the end of the day. Bill, I’m no economist but does this sit with your view of the UK. If you think that increasing our total indebtedness (whether by increasing State debt, or private debt) is the solution to our woes, then you are dangerously mistaken. There are at least about 2.5 million unemployed productive resources in the UK at the moment. Not that I’m a war-mongerer, but there was plenty of productive capacity at BAE Systems – it’s just that they didn’t have any orders. Yet according to Osborne, they should be investing more for the glory days just around the corner. Charles Steindel emails to remind me that he actually did a quantitative assessment. In that analysis, he asked how much our estimates of actual growth are affected if we consider the possibility that (a) what Wall Street was doing wasn’t actually productive (b) much of the housing will end up being less useful than expected (e.g. ghost towns at the edge of urban areas). There are 4.8 million without work who want it. And probably quite a few million more with insufficient work, but the ONS statistics do not make that figure clear as it does the others. How can unemployed people be productive resources? If they really were productive they would be employed, right? The hard cold fact is that only innovative people are productive people these days. The aim of all work is wealth-creation. I have no engineering degree, nor any other advanced competence, and I have noticed that I am not in demand as labour. Why? Because I do no create wealth. You’re asking your own question and then answering it. Productive capacity man. Productive capacity. If it’s so obvious that supply side spending by the governments hasn’t worked why not try demand side stimulus? Send the money to the consumers and let the private economy save the system. Kind of radical in a socialist way, I suppose. Politically, we need to bailout banks and investment firms so they can buy all those corporate jets and keep the politicians in office! The graph in your link is pretty meaningless by itself. First, it is not how much debt % GDP that matters, but what the maturity, repayment terms, and, for government debt, the currency they are denominated in. Second, most of these governments are sovereign in their own currencies, and so cannot become insolvent, unlike a household or business. Remember also that governments typically “borrow” at significantly better terms than the private sector. I’m in UK (pity me?) and I completely agree with the post. Though I wouldn’t agree the people of the country entrusted Osborne and the Tories to repair the mess (they didn’t win a majority at the election). I don’t understand why so few get the notion that absence of demand is the problem. The Thatcher generation, I suppose: she likened the Exchequer to a housewife’s budget. We’ve got a huge windmill program starting offshore soon, sufficient to power most of Wales. Let’s get going with it, and more? Just print money…..and set people to work. And then tax it back. Is it really that complicated? Sadly the word “economics” means “housekeeping” in Greek. It all went wrong from there. Looks like you’ll be heading for Russia then? No? While it is true that households are up to their eyeballs in debt, and are deleveraging aggressively, sovereigns who issue fiat currencies need not be in debt at all. While it is true that the current collapse of debt withdraws funds otherwise spent on demand, and existing interest payments on private debt with draw funds otherwise available for demand, sovereigns who are issuers of fiat currencies need not borrow, need not pay interest at all. A bank note denotes sovereign credit, not sovereign debt. The sovereign’s only obligation to the holder of it’s banknotes is to replace defective ones with new ones. There is no obligation to exchange said notes for commodities, including precious metals, base metals, grain, whatever. The sole obligation is to replace the banknote with another of the same valuation. 1. The Sovereign’s treasury dept issues bank notes, or their computerized equivalent, not the central bank. 2. The sovereign’s treasury dept loans bank notes to the central bank to augment it’s reserves, and collects interest on such loans. 3. The sovereign’s treasury dept controls the amount of reserves in the banking system by setting the interest rate, thereby making such use of funds less attractive, generating voluntary surrender of said reserves, or by calling loans to the central bank, thereby draining reserves from the system in a cascading fashion. Given this scenario, the sovereign need not borrow from the central bank, instead the central bank borrows from the sovereign. The sovereign need not issue debt to finance deficits, instead it buys the services it needs and creates bank notes as necessary, and this demand results in increased deposits and money flow through the economy. These deposits work their way through the system, becoming increased reserves, which the sovereign can recover via tax, or by calling Central Bank Loans should that be desired. The purchase of services and labor by the sovereign, moves bank notes into the hands of those who will spend it for other goods and services, thereby increasing the velocity of money in the economy, and providing those entities with the where withal to pay debts. The latter item essentially supports the banking system. The sovereign by labor acts controls the demand for and proportion of the GDP credited to labor. Such laws as those restricting juvenile employment, hours worked per week, vacations, and benefits, all affect the amount received by labor for it’s services. A sovereign should strive for 60% of GDP being credited to labor, increasing the power of labor when this figure is lessened and curbing the power of labor when this figure is exceeded. A generous pension scheme, permits the prompt retirement of the oldest generation, making room for younger workers, and obviating the need to save for retirement, which essentially means deferring demand into the distant future. It is essential that all decision makers acknowledge the macro economic impact of worker uncertainty. Uncertain workers save more and SPEND LESS and DEMAND LITTLE and ARE POOR CUSTOMERS. Give a man stability and he SPENDS MORE, IS A GOOD CUSTOMER, and DEMANDS LOTS. Similarly, a single payer health system has in country after country proven to meet the needs of populations at a fraction of the cost of a private system, and has been shown to eliminate bankruptcy through medical expenses, public health problems due to untreated pathogenic conditions, and lengthens life through better routine care and prevention. All this translates into GREATER DEMAND. You’re absolutely right there Dr George, I waste far too much time worrying about retirement and burying little bits of paper away for a rainy day. It is one of my biggest anxieties……. that’s why it is such a good mind control tool. The fear of a destitute retirement keeps that clown smile on my face, as I yes sir, no sir, three bags full sir to retain my job. Dr. George: A bank note denotes sovereign credit, not sovereign debt. IMHO, that is not a good way of thinking about things, and introduces unnecessary and obscuring complications and confusions, with no benefit at all. Credit is (the opposite of) debt. Always. Credit without debt or debt without credit is a contradiction in terms. Currency is a form of debt, just like bonds, which are nothing but currency with a date in the future printed on them, just as currency is nothing but matured bonds. The only obligation of the sovereign to the holder is that it accept non-defective banknotes as discharging obligations of the holder to the sovereign. E.g. taxes. Otherwise there is nothing to dispute with what you said. So does this new lending program in the UK stand a chance of actually providing some stimulus? It sounds a lot like “state directed lending” which Warren Mosler credits for a large stimulatory effect in China (20 percent of GDP there). WM says such lending by the state is the equivalent of deficit spending. It also sounds somewhat similar to the US Federal Reserve Targeted Asset Lending Facility (TALF) that was briefly conducted in the US after the financial crisis (which has come under much scrutiny lately). Most of government spending *is* on labour. So there isn’t a mismatch at all. One is largely a subset of the other. I would say 60% is probably too low. A 70/30 split seems more appropriate given the service nature of the economy. A widget making machine which is switched off has productive capacity, but is unproductive. A unemployed human being who is willing and able to work also has productive capacity, but is also unproductive. Somebody please explain to me why the BoE cannot simply lend out to SMEs. Ok. If it is true, answer me then, why have the western world choosen this way? Good question. I put it down to the fact/assumption that humans only evolved into consious reflective animals a few thousand years ago. I don’t think we’ve mastered control of it yet on an indivudal or collective basis. Some of these MMT chaps do appear to be ahead of the curve however. If you can get hold of Bill’s and Joan Muysken’s book Full Employment Abandoned, the first chapter describes, perfectly in my view, the shift from a full employment framework by governments to a full employability framework after the second world war. The rise of neo-liberalism if you like. I highly recommend it. Neil Wilson, no it isn’t. Most government spending is on pensions and unemployment benefits. Particularly in Europe. I take your point though that there is double counting. I was aware of this when I made my initial comment, which was somewhat tongue in cheek. I think Neil Wilson is right. As far as GDP is concerned most of government spending is on labour. Social security spending, unemployment benefits and similar are transfer payments — they do not buy goods and services, and they don’t count towards GDP. Most supporters of Austerity or the majority seem convinced there is some reason to think future growth is going to be less than past growth and so everything should be cut. They include people like Jim; but they never explain why future growth should be less. If there was adequate demand growth would rise and eventually become equal to productivity growth so higher tax revenue would allow a balanced budget. It has worked before. I would be pleased to know why people believe in this limit to growth idea. Is there a fact based reason to agree with it? I agree with that. IMO, there is a medium of exchange problem that is affecting the retirement market. The so-called public debt of a sovereign country is not really debt at all, because it never needs to be repaid. ” because it never needs to be repaid”, then why did the Western governments, led by Gordon Brown et al. make such a big deal of writing off African countries’ debts? Why is money lent to countries? Would you lend to someone if it never needed repayment? Look, I understand and fully get and support the full employment aims of MMT. And having read some of the ideas about fiat money being an invention, I kind of understand that. But I simply do not understand the idea that money lent is actually a gift (which it is, surely, if not needed to be repaid). The thing is that the sovereign debt – usually thought of as bonds – IF they are issued in a domestic fiat currency, are nothing but “fiat bonds” which can be “paid off” in one sense simply by “printing” fiat money, just the same way that the “fiat bonds” were printed. But the true “paying off” of such monetarily sovereign debt only occurs when the state accepts these bond or currency liabilities for payments to itself – taxes or sales of something to the bond or currency holder. Why did the Western governments, led by Gordon Brown et al. make such a big deal of writing off African countries’ debts? These were debts denominated in currencies foreign to the African countries. Taking on such debts is something that a state should almost never do – which is why the international finance thugs push them so much, which is why their pet economists, the mainstream, do not make the crucial distinction between domestically-denominated & foreign-denominated debt. The burden of foreign-denominated debt can go to infinity in domestic terms, be completely unpayable. Which is what the thugs want. Would you lend to someone if it never needed repayment? That is what saving money is. You are storing up claims against the issuer for an uncertain future. These money claims would have no value if they were not ultimately backed by the power of the state to tax & impose fees, perhaps for necessities. If a state keeps inflation low (below 100% say :-) ), prices stable, then money will be a good store of wealth. Net total savings of the whole economy may increase from year to year, be never paid-off in the net total, the government running deficits. All the while each individual actor in the economy may be “paying back” large sums to the state in taxes, say. Some may even pay more than their income :-( . So while it may never be “paid back” in one sense, it is always being enforced & paid back (“refluxed”), in another. The state doesn’t need your money to get money for itself – it has an infinite amount of that – it needs to inflict the pain of taxation & fees on you in order to give its favors, its debt, its currency, value. What matters is what the money is denominated in. If you owe something that is denominated in a third party liability – as is the case is Greece (Euro) and when a country has foreign debt (the African countries) then that is a real debt that has to be repaid with real future work and energies. Stuff has to be made and sold so you can buy the currency to pay the debt. However if you owe something that is denominated in another liability which you also control then it simply isn’t a debt. It is a mere liability and can be eliminated with a simple accounting journal. A few electrons are momentarily inconvenienced as you push the computer button but that’s it. Nothing real has to be made or sold to change the liability into a different liability. So a UK Gilt denominated in GBP can be eliminated by the UK government by simply increasing the amount of GBP and reducing the amount of Gilts. But a UK development loan in GBP to Kenya requires the Kenyans to sell flowers and wheat for GBP so they can reduce the liabilities. They can’t just issue Kenyan Shillings because that would affect the Shilling GBP exchange rate.